Here at PBwiki we try to make adopting new technology as easy as possible (make a wiki as easily as peanut butter sandwich). That said, it can be intimidating to be the person at your company or school district to take on the status quo. 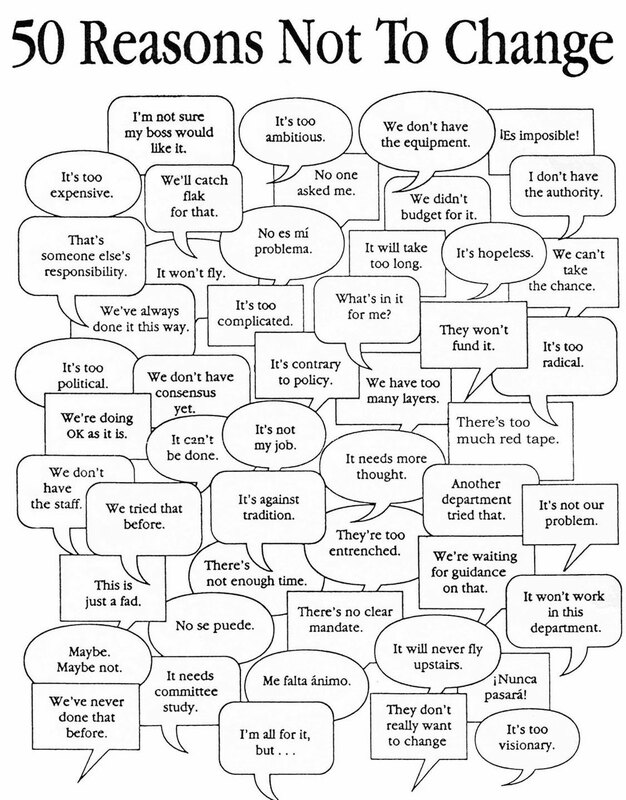 Maybe you’ve seen some of these excuses – what is the best excuse you’ve heard from your organization? The picture needs to be resized. It is too large to see the entire photo. It’s bad enough they hotlinked the image; is using it to hawk their wares really considered “non-commercial”? Thanks for pointing that out, it’s fixed now. The one excuse I don’t see and maybe it’s my age showing, but it’s “I don’t know how to, can someone train me here?” There a lot of us older teachers willing to try but we need to know how. Good point. Educators are really great about training and passing along the best new teaching tools. You should check out educators.pbwiki.com – we have a bunch of tips and training materials for you to use — and add your own ideas! I would like to remind folks again that the image has a copyright which requires attribution. The large image stored here (PBWiki) is improperly labelled and does not maintain the copyright which is required. Thus others who have used this image on their sites have inadvertently broken the usage restrictions. It is proper to cite the reference to this PBWiki site as the hat tip but this does not substitute for the attribution. Thanks, I updated our post to reflect the exact blog post where the image originated. heheheh!!!! LOL!!! its so funny ever!!! u people take my breath away!!!!! !